Bella Vista Jupiter FL has two distinctly different communities in the complex. First, are the one story, quad-style villas with split bedrooms, a large patio and fenced courtyard. They are 1,400 sq. ft and have a nice open floor plan with vaulted ceilings. Bella Vista on the Parks, are the 3 story condos that sit on Carlin Park. The downstairs units have 2 bedrooms, 1,100 sq. ft, and the second floor units are two story 3 bedroom townhouse style, with a loft area of 1,800 sq. ft. They have two master suites - one on the ground floor and one on the second floor. View current listings for Bella Vista condos or read more about the features you'll find in this popular Jupiter community. 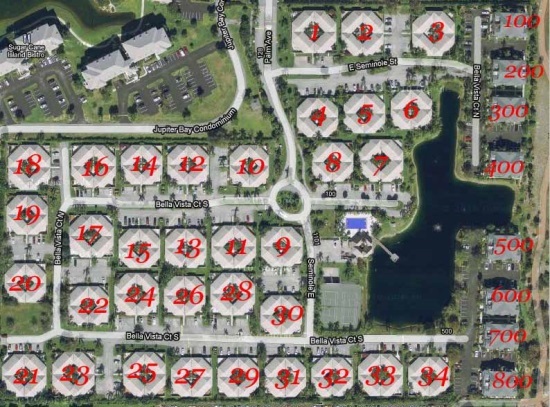 The community of Bella Vista Jupiter features 34 buildings with 4 units per building. Bella Vista villas are very desirable, especially for buyers looking for Jupiter condos without stairs. The split bedroom plans with the fenced patio is very appealing for outside entertaining including grilling and just relaxing outside. There are a few 3 bedroom one level condos but the majority are 2 bedrooms. Bella Vista has tennis courts, racquetball,Bocci and a community pool overlooking the small lake. They allow 2 pets up to 30 lbs, but trucks, motorcycles are not allowed. Lease restrictions allow minimum of two rentals per year with a 30 day minimum. and the location is close to the beach, shopping and restaurants.Bella Vista Jupiter condos are close to shopping, restaurants and the Maltz theater. Walk over to the beach through Carlin Park which has a fitness trail, tennis and an amphitheater. While you're in Carlin Park, stop at Lazy Loggerhead for breakfast or lunch. Neighboring condominiums include Sea Palms and Jupiter Bay both popular beachside communities in Jupiter. Just across the street you have the Maltz Theater, the Jupiter Beach Resort and a short walk away you have the par 3 Jupiter Dunes golf course. It's a great place to tune up your short game. We have several restaurants such as the Food Shack and The Dive Bar for dining and entertainment. Call me to show you more Jupiter Beach real estate. Search for more oceanfront real estate. See Singer Island ocean condos for sale and Juno Beach condos for sale. If you have questions, or would like to view a Bella Vista condo or more Jupiter beach condos, please don't hesitate to email or call Jim at 1-561-744-7025 for assistance. Bella Vista Condos Jupiter,603 Xanadu Pl, Jupiter Fl 33477. Jupiter Oceanfront Condos by Jim McLane See his profile on Google.